Packs into a small , strong plastic case – 8.5 x 4.5 x 3.5 cm. 110-gram canister will burn for about 45 minutes at full output. 220-gram canister will burn for about 75 minutes at full output. Continue reading to find out why I give it such high marks. This stove weighs 90 grams and is ideal for backpacking in the backcountry. The fuel is LPG ( liquefied propane gas ). The burner parts are constructed of brass, aluminum, and stainless steel. The stove burner has an output of 10000 BTU’s and it will boil 1 liter of water in 3.5 to 4 minutes at sea level. It simmers very well and I have also added the windscreen that goes with this stove. 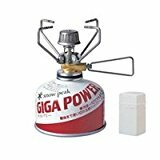 I have owned The Snow Peak Gigapower Stainless Steel Stove for many years now and I have carried it with me almost every time I head out into the backcountry. This stove is not in the same league as the ” white gas ” type stoves, however, if you are looking for an excellent, top performer this is a stove that I can surely recommend! This is my favorite stove and it has never let me down. I always carry this in my day-pack with a small 110-gram canister for a quick mid-day coffee or tea. It fits well into the Snow Peak pot and cup, – canister and stove. Excellent companion in the Backcountry! If you have any comments, questions, or suggestions about this stove, other stove types please feel free to leave them below. I will answer them all in a timely manner.